A new synthetic turf field was installed at Ralph Wilson Stadium in 2011, and received rave reviews by players, referees and even fans watching Bill’s home games on TV. Four years later, the organization came back to A-Turf to improve the stadium’s field tunnel floor. 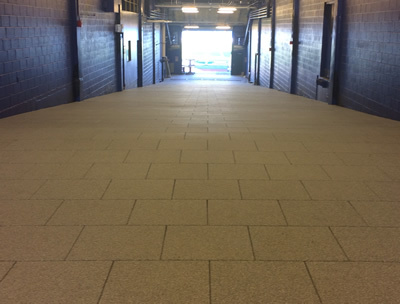 The athletic field builder company turned to its sister company, Surface America, who installed its UltraTile product. The patented super durable rubber tile has superior noise and shock absorption, and a top wear layer that lasts more than 100% longer than other rubber tiles. It was simply installed over the existing concrete surface.